The purpose of this project is to re-create Lord Kelvin's water-drop electrostatic generator, also known as "Kelvin's Thunderstorm". Water is made up of mobile polar molecules. By bringing a positively-charged object close to a water dropper, the water droplets, and also their container, will acquire a negative charge due to induction. There is now voltage due to the separation of charge between the drop and the droplet container. 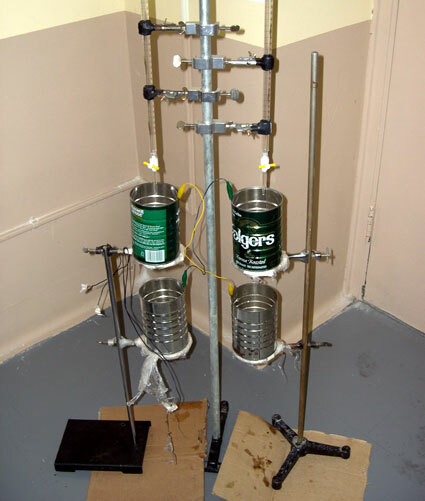 To make a self-sustaining electric generator, an additional water dropper-container system needs to be substituted for the positively-charged object. In the example given above, a positively-charged object was used to induce negative droplets in the container. Therefore, a negatively-charged object can similarly be used to induce positive droplets in another container. By wiring the positive container to a conductor, this will effectively duplicate the effect of a positively-charged object's presence. The same can be done with the negative container and another conductor. Set up the equipment as shown in the diagram. Make sure the connecting wires do not touch each other. The voltage in the top cans was then measured using a voltmeter and recorded. Set the burets to drip the water droplets at a moderate speed. After a while the voltage in the bottom two cans was measured and recorded using a voltmeter. The voltage in the bottom can and the ground was then recorded in order to ensure that the voltages we were getting were actually from the water droplets and not just from the other can. Below is a data table that contains our initial and final voltages in our five trials. The water-drop generator worked since it produced a small (~7 mV) increase in voltage from the initial voltage.